Brick Pavers historically have been produced from high fired clay which creates a long lasting material that can be used for driveways, patios, walkways and pool decks. Clay brick pavers, unlike concrete brick pavers, offer a much deeper color and the user can rest assured the color will never fade. To many masons, architects and builders, it’s somewhat of a misnomer to call a concrete paver a brick paver, simply because "brick" generally means made of clay rather than concrete. Brick Pavers are offered with beveled edges which provide crisp lines to any design pattern you choose without the need for mortar. Brick pavers made from clay are made under extreme pressure and offer compressive strength much greater than concrete pavers. 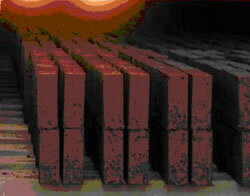 Brick pavers produced in clay offers various clay colors and sizes, although nowhere near the choices available for concrete brick pavers. The longevity of being real clay is a guarantee that rich colors will always stand out more than those made from concrete. 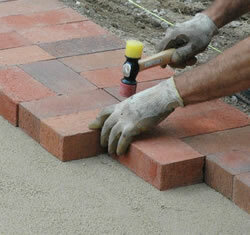 Choosing brick pavers for a patio, driveway or walkway has been made easier over the years. Companies such as Ackerstone Pavers, one of the leading manufacturers, offer brick pavers in solid colors, blended colors, shotblast and ground finishes and even shell stone in order to achieve the various textures. 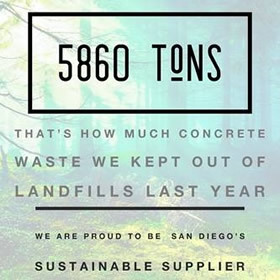 There are manufacturers like Belgard who have created a strong brand in their products by offering the public at-large beautiful catalogs which depict higher than average priced homes using the Belgard product around the home. If you visit ALL Masonry & Landscape Supply, you'll be given free brochures from Ackerstone Pavers and other leading manufacturers in California. At our company, we have taken over 10,000 square feet of our property and installed pavers of almost every shape and color for your choice of use. 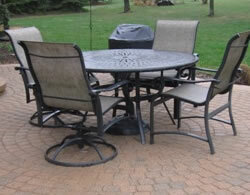 We can help you choose your brick paver, give you the cost its cost, sell you the assorted material it requires to build a brick patio, rent tools that will help you lay the pavers and deliver everything to your home so you can began installing your brick pavers.